oh. such a tease, you. you. all hairy like that. oh stop it! Bro after all this filming you are looking like the wolf man. Awesome shirt! La compraste aqui en Mexico? my name is matthew patel, and i am ramona’s first evil ex boyfriend. muhahahaha. and not ONE grey hair ! Keep moving forward Ed – one crisis at a time and all that. Any parallels between your shirt and the new EELS record? Ahhh lol. Where do you find your cool shirts..no seriously where? 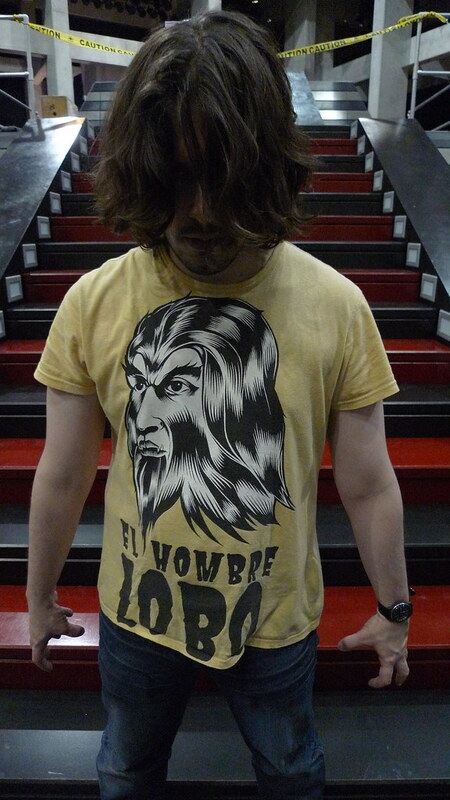 The wolf man, pure awesome in shirt form? Did you get a chance to check out Fox Theater’s 3D movie festival? it ended last night with Andy Warhals ‘Flesh For Frankenstein’. a must see in 3D. they also had ‘Dial M for Murder’, ‘House of wax’ staring Vincent Price, ‘It came from outer space’, ‘Creature from the black lagoon’, and others. I think that’s a Charles Burns shirt! Is Charles Burns in the movie?? Have you been directing Charles Burns Vs. The World THIS WHOLE TIME??? Whoa, best picture yet!! where can i get one of those t-shirts and do they come in red? forget that – it had thrown me out so i had to re-register my email & wasn’t showing my comment pending. sorry edgar! Cool shirt Edgar. Did you guys hear about the Scott pilgrim video game. I hope it comes out on the wii. Good news… no grey hairs! In need of a holiday?? ah give us a smile? no? okay then…. SPOILER: Edgar Wright plays all the characters. All of them. And then the madness set in on day 81! Veins popping out on your hands and everything, very intense! Me dejaría morder por este hombre lobo… MUAK!! GUAPO!! Me dejaría morder por este hombre lobo….MUAKK!! GUAPO!! Me dejaría morder por este hombre lobo….. MUAAK!!! GUAPO!!! Is that a Charles Burns drawing? This is beautiful, and the last one I get to see for 4 weeks. I hope filming doesn’t fall apart without me. Poor Edgar… looks like missing out on Comicon is taking its tole on you. I’m going for Bryan Lee O’ Malley’s signing tomorrow. Indicative of your deteriorating mental stability? All work and no play makes Edgar a dull boy. Sidenote: Just watched American Werewolf in London all the way through for the first time. It’s the balls! Man, when John Landis was on, he was really on. I don’t know why they’re doing a remake because the original is perfect, but my dream crew/cast would have you as director and Brandon Routh as David.